This mini-challenge is about bookish pictures! I use my Instagram to post pictures of the books I'm currently reading or the ones I recently bought. Scattered throughout my account you might find snippets of my life and past. You can find my IG over here: Mel_1704. I am going to show you a different range of photo's, starting with a Books(h)elfie and proof I've been a reader for a very long time. Instead of walking with dolls I used my doll carriage as book trolley. 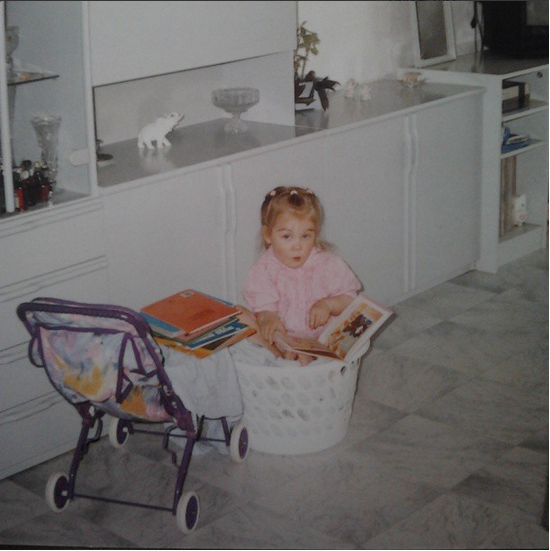 I was also fond of comfortable reading spots, like sitting in our laundry basket. A couple of my favorite editions. I recently got the HP scholastic box set & these are the Dutch covers for some of Neil Gaiman’s books. And lastly, my favorite bookish mug, prettiest inside of a cover & my trusty e-reader, a Kobo Glo. I love your pictures Mel!They're absolutely gorgeous. Love your pictures, Mel! You are so pretty!! 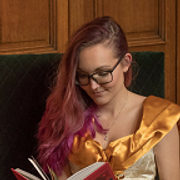 <3 What is that book with the gorgeous picture inside??? I need that just for that picture. That is Marissa Meyer - Fairest! 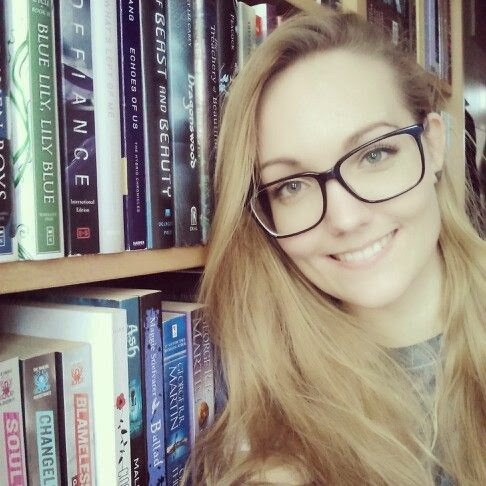 Mel, you look positively lovely in that bookshelfie. ;) Love these snapshots you! Young you reading is so adorbs too! I'm always surprised my parents have no pictures of me reading as a child, since its all I did. We have plenty from the last 10 years. Probably because people just didn't take pictures for regular things back when we had to worry about consuming film. Oh yes, I remember the time you had to be careful, because you only had one chance for a good shot! Your Neil Gaiman books are beautiful!! Ahhh the inside of Fairest... soooo pretty! I love those Neil Gaiman books! What a lovely collection! What an adorable photo of you as a youngster Mel!! Those Neil Gaiman books are GORGEOUS, wow. Love the mug <3 Love your photo choices Mel, thanks for sharing!!! It's sometimes crazy to see yourself so little! Tiger Lily is the best! Aww these pictures are so cute! I love them! Book shelfie! How fun! I definitely want to read Tiger Lily soon! I've heard so many great things! And wow, that Laini Taylor cover and inside are both gorgeous!!! Thanks, means a lot coming from you! The cover of Dreamer's Pool is so gorgeous! I need to start reading some Juliet Marillier books. So many pretties, I love! Mel, your photos are absolutely gorgeous! (Also, I have no idea why I wasn't following you on Instagram. I remedied that now.) But seriously, you've chosen some lovely ones for this challenge. I adore that you began with a personal touch, and love that you shared some favorites! Personal shots are always the best! Mel! Your photos are so gorgeous...and that one of you in the laundry basket is so adorable! Wow, thank you! I always feel a bit 'mweh' about my photos, so that means a lot. Oh, you take lots of pretty pictures! I especially love the Tiger Lily one! Haven't read the book but I really want to :) LOVE the Harry Potter picture. I'm currently reading the series, but I just KNOW that I'll need to buy the redesigned covers. Lovely pictures; the Gaiman collection looks particularly cute as a set. Haha that's so cute that you used your trolley for books instead of a doll! And those Dutch covers for Neil Gaiman's books are beautiful! I usually don't like Dutch covers, but these...! That is indeed a cute a picture of you as a little kid! Your other pics are awesome as well. I particularly liked the Cruel Beauty pic and the Neil Gaiman Collection. I've been thinking of buying a new set of Harry Potter books, with a new design of covers, especially because mine don't match. I loved that picture of the inside part of a cover. Sooo beautiful! The HP box set is SO PRETTY. I love the picture of young-you reading! I wish I tracked down one of me like that. So cute. I love when people can share that they've been readers their whole lives. People always ask when I started reading or what books got me started, but really it's just been my whole life! Haha, I love that you decided to sit in the laundry basket to read. Little you was so cute. :) And I love the bookish pictures that you took, especially the one of Cruel Beauty. I have yet to read Cruel Beauty, but I might end up reading it because I love fairytale retellings. Oh, thank you Jeann :D! My books always look fabulous <3 haha. EEP I love these photos. I have a picture of me when I was a kid asleep in a laundry basket... your face is the cutest in that photo! I SEE CRUEL BEAUTY EVERYWHERE and I'v always wanted to cave butttt the mix reviews :/// One day my curiosity will get the better of me! These snapshots made me smile! Yes, you do have proof that you have always been a reader around, ahaha and I love how you made use of the trolley. Who needs dolls after all?